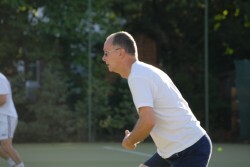 We have eight singles and three mixed doubles box leagues – something for everyone! Our long established singles box leagues are very popular with members- we have over 80 members competing in our leagues! We have eight divisions offering a wide variety of standards. Each box leagues cycle last approx 10-12 weeks and divisions typically have 10 players. At the end of each cycle two players are promoted/ relegated. The singles leagues are administered by Solly Solomon, so if you are interested in joining please contact him, all information can be found on the noticeboard upstairs. The mixed doubles box league has now grown to three league: that’s over sixty players enjoying competitive mixed doubles play. Helen Hunter is our organiser so if you would like to join please contact her in the office. As with singles leagues, information can be found on the noticeboard upstairs in the hall way. If you’re a new joiner to BLTSC our box leagues are an ideal way to meet other members, get you playing regularly and value for money from your club membership. All box league games are organised by players contacting one another and arranging their matches AND it’s worth knowing you get a point even if you lose! A fun, sociable group fitness class open to people of all ages and abilities.